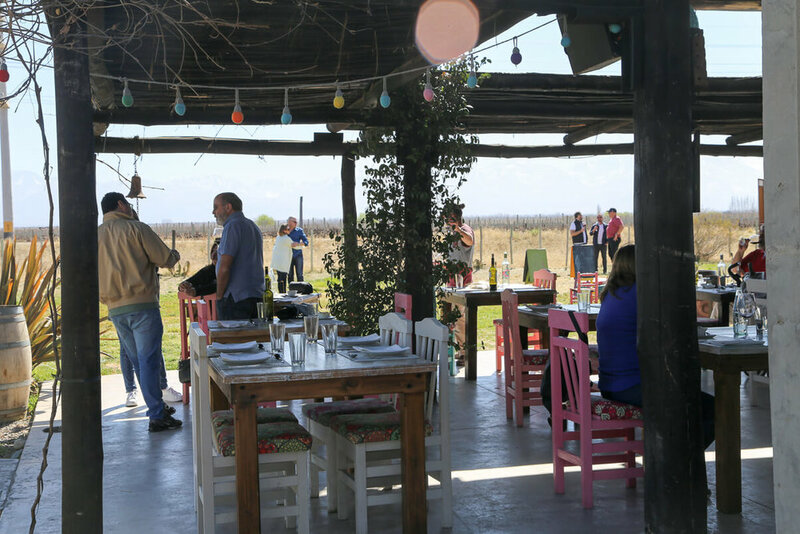 I visited Bodega la Azul for lunch on our first trip to Mendoza back in 2014 and it was the best meal we had the entire trip. So obviously lunch at Bodega Azul was the first thing I locked in when I started planning our second Mendoza trip this year. I have been recommending their winery and restaurant to friends for years, so I'm excited to share about our experience here as well! Note: We were graciously hosted by Bodega la Azul during our stay in the Uco Valley. All opinions are my own. 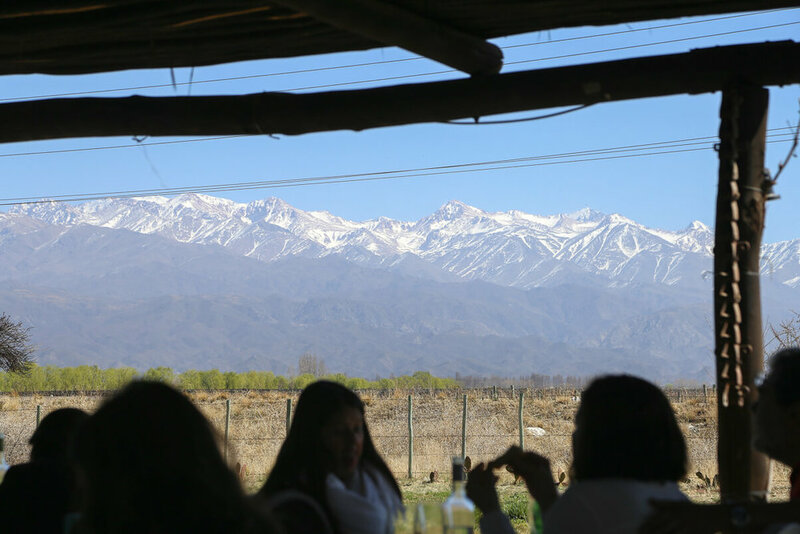 This small family-owned winery is in the Uco Valley in Mendoza. Why the name La Azul? This land was originally owned by Francisco Hinojosa, the current generation of owner's grandfather. He grew the vineyards and developed the land. As he grew too old to work the land, he decided to divide his property amongst his four daughters and one son. Francisco divided his property into five, assigning each parcel a color. His daughter, Shirley Hinojosa, received the blue card. This land has been La Azul (blue in Spanish) ever since. It's still managed by Shirley and her three children. La Azul may be the smallest winery in the region but is full of heart and passion. The lunch menu is a five-course meal with wine pairings. The meal consists of three small starters, the main course (we were able to choose from four options) and dessert. Each course comes with a wine pairing and your glasses are topped off as much as you'd like (coincidentally bottomless wine is my personal heaven). Most tables even ended up with a bottle left at the table. After being seated, our server introduced herself (Hi Teresita!) and brought us waters, bread (baked in the clay oven around the corner) and baba ghanoush. As she explained the menu and gave us our options for the main course, she poured our first wine: a crisp and refreshing sauvignon blanc. I chose the flank steak and my husband ordered the bondiola (pork). He actually ordered this same bondiola on our first visit in 2014 and he was excited to see if it was as good as he remembered. Y'all, the food was as good, if not better than we remembered. 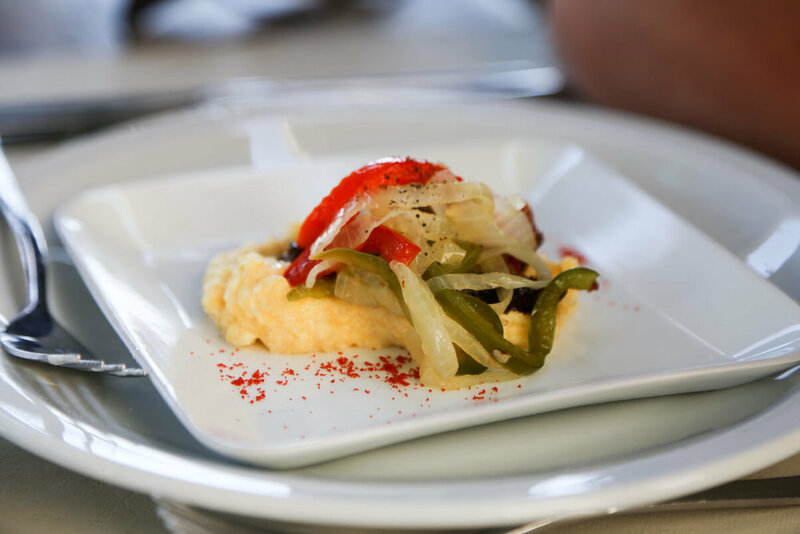 The first course was braised oxtail over polenta. The second was a choripan, a classic at any Argentina BBQ. It's traditionally a chorizo sausage served on a crispy bread, but Azul put their own spin on it. They cooked the chorizo in sauvignon blanc, garlic, and thyme and served it on bread they baked in their clay oven. The third and final starter is an empanada baked in the same clay oven. After our starters, we took a break before eating our mains. Most tables were doing the same, stretching their legs and relaxing in the grass. Teresita filled our glasses with our wine of choice and left us in peace until we were ready for our steaks. It was technically still winter, but Mendoza didn't get the message. The weather was incredible, sunny and in the 70's. 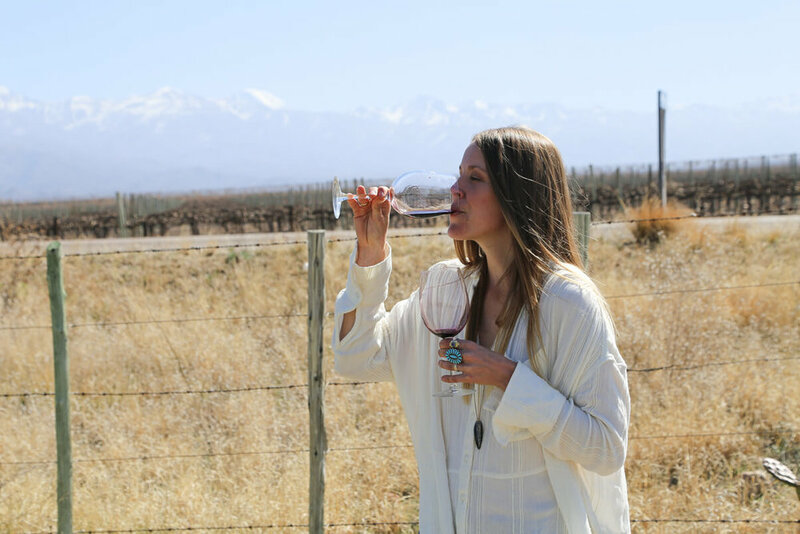 There are 330 sunny days a year in Mendoza (being a desert, there isn't much rain in these parts), so you'll likely get good weather whenever you visit. But don't worry, if you're visiting in the heart of winter there is an indoor dining room. I lost track of how long we were relaxing, let's say we relaxed for one full glass of wine amount of time. Eventually, we returned to our table for our mains. I was a bit worried about the temperature of my steak, to be honest. All week in Mendoza I'd asked for medium and but got very WELL done. But Bodega Azul got it perfect, pink and juicy in the middle, not rare and nowhere near well done. And Martin's bondiola? Exactly how he remembered. Perfection. Four hours of cook time had rendered it so tender there was no need for his knife. It was like butter. The fresh vegetables on both plates were also a nice touch after a week of heavy food. We ate a lot at La Azul but never felt that overfull stuffed regret you feel when you've overdone it. Perhaps it's because we took our time, enjoying our afternoon. But I'd also suspect the quality of ingredients had a lot to do with that. We took another short break on the sofas before eating dessert. 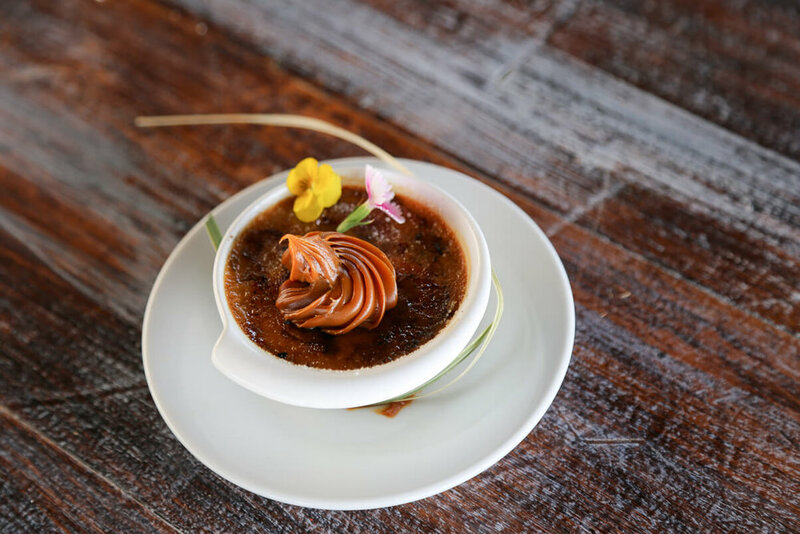 Dessert was dulce de leche creme brulee with a glass of the sauvignon blanc we started with. Perfection. Martin can attest that after nearly a decade in Argentina, I'm done with dulce de leche. It's in everything and it's just too sweet for me. But it wasn't overpowering or overly rich here. I happily cleaned my little dulce de leche filled plate. Lunch includes a visit to where they produce the wine with a private tasting straight from the barrel. We enjoyed having the chance to talk to Teresita about the winery, the culture surrounding wine and her own studies. The wine we tasted was a reserve that still has a couple of years left to age in the barrel. I can only imagine how good it will taste then because it already tasted great! If you enjoyed the wine you had with your meal, you can purchase a bottle (or a few) to bring home with you. It was very affordable, with the younger line starting at 140 pesos at the time (September 2018). If you're flying within Argentina, you're allowed to bring up to 6 bottles per person in your carryon. We bought a case here at La Azul and counted it as my carryon back to Buenos Aires. Keep in mind that it must go under the seat in front of you. You should definitely reserve ahead of time to make sure you get a table. Email them via their website here or follow them on Facebook. After a long lunch (we were the last ones to leave, so I thank everyone at the restaurant for their patience haha), we checked into our room at the Finca la Azul Casa de Huespedes. This small, 6-room hotel is deeper onto the property than the restaurant, so it's very peaceful. The property is surrounded by trees and the vineyard. Read more about Finca la Azul on Tripadvisor to read personal reviews and compare prices. The hotel is gorgeous and the floors and walls are covered in handwoven tapestries from across Argentina. We were given a room with two double beds on the ground floor, so the sliding door opened up to a private patio. I really liked the stone walls and rustic decor with modern touches. There's a restaurant in the hotel (in the hotel lobby and common spaces, separate from the restaurant for lunch at the winery). They offer a three-course dinner with wine pairings for $800 pesos (cost at the time of writing in September 2018, the equivalent of around $20 US). We passed on dinner in favor of an early night in (we were still full from our huge lunch!). Since we skipped dinner, we woke up starving! Argentine breakfasts can be very underwhelming if you're used to a continental breakfast. A person can only eat so many slices of toast before it's like, ENOUGH (for me, that number is 1 piece of toast. I don't like toast. I don't like Argentine breakfasts). So imagine my joy when I saw the Finca la Azul's breakfast buffet! A bowl of fresh fruit! Plain yogurt with granola and cereals! Avocado! We really enjoyed our time at Finca la Azul! I really recommend basing your stay in Mendoza in the Uco Valley rather than in the city of Mendoza. It's a beautiful area of the country and it's home to the most beautiful wineries and the best wine. 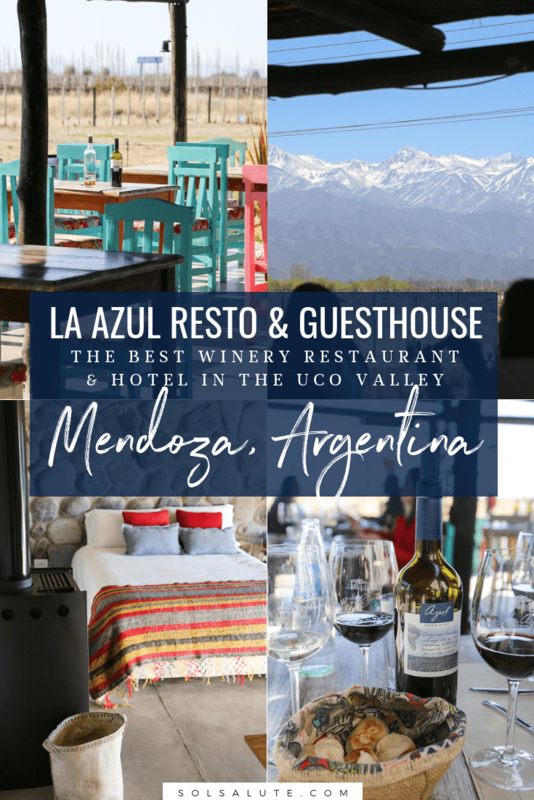 The Finca la Azul Guesthouse is a great base to explore Mendoza. So what are you waiting for? Check rates for your stay now.